One of the pillars of UC Berkeley's Mechanical Engineering program is the Senior Capstone Design Course. Every year, senior students are asked to work on an ME design project that addresses a specific problem or mission. For the 2016 Spring semester, six students in Team SkyBison were asked to design a solution to give the DJI Matrice 100 unlimited hover time. The Matrice 100 (M100) is a customizable aerial platform, fully programmable via the DJI SDK, built for developers and industrial users. In its standard configuration, the M100 has a 40 minute maximum flight time through a dual battery configuration. If the platform were to be able to remain airborne for longer periods of time, it could be used as a temporary structure for data transmission — essentially, a mobile cell tower. Based on this, the team is tasked to design a tethered power solution for the M100 that would be able to provide it with theoretically unlimited hover time. We talked to Justin Wang and Grace Alexander from Team SkyBison to hear about how they thought through designing their solution and what they see as possible applications for it. What were the most difficult parts in designing this hover solution? The main challenges of the project were minimizing weight and managing the tether. Because the M100 has a limited payload, any components added onboard to the drone had to be lightweight. The automatic tensioning system was required to manage at least 100 feet of cable and also needed to be reliable enough to prevent the tether getting caught in the propellers and causing a crash. Team SkyBison divided into two sub-systems to design the powering and tether tensioning components of the modified M100. The two teams would set deliverables throughout the semester before combining the two systems and doing flight tests. 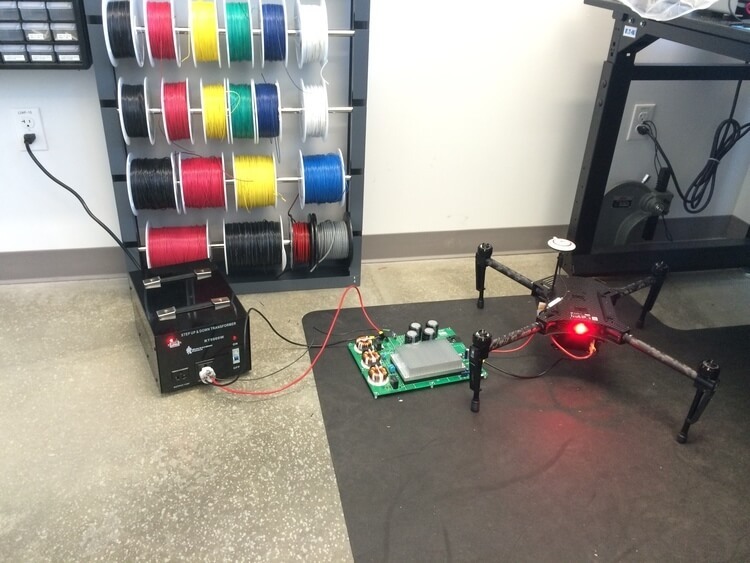 To power the drone, we decided to use AC to transfer power from the ground to the drone. AC was chosen because it is easier to convert to a higher voltage. Higher voltage allowed for less power loss and ultimately a smaller diameter wire for the tether. Household 110VAC was stepped up to 220VAC using a voltage transformer. The 220VAC at the ground was converted to 24DC on board the quad with a TDK-Lambda PFE1000F power supply. The tether itself is composed of three 22AWG wires and bound together with a small length of heat shrink every six inches along the 120 ft tether. The total weight of the tether ended up being 1.2 lbs. When all the components were sourced and the wiring was complete, we attempted to power on the M100 without any propellers attached. We were able to successfully turn on the quad as well as throttle the motors. We also took initial heat data of the power supply which suggested that a fan was needed which we added later on. The spooling system was designed to apply tension to the tether to prevent it from tangling in the propellers when the drone descends. To apply the tension, two constant force springs were used, which are pictured below. To prevent the springs from being overwound and to reduce the torque between the spring and the spool, there is a 16:1 gear reduction between the spool and the spring. This allows the spool to release 120 ft. of cable while keeping the springs within their safe operational range. The gear train was custom designed and manufactured from acrylic using a laser cutter. 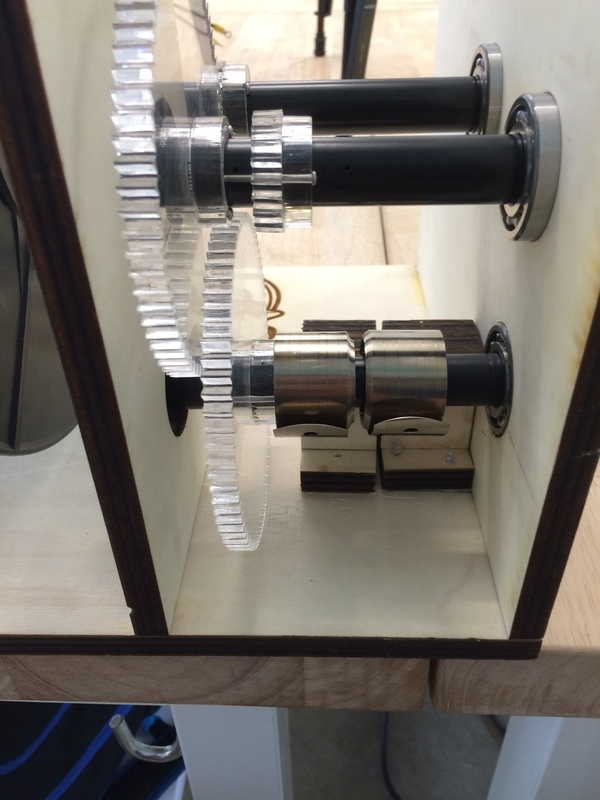 The gear train is housed along with the spool in a laser cut plywood chassis. After both the powering and tether tensioning systems were verified to work independently, they were combined and tested. The complete system seemed to work and flight tests were conducted. Power supply heat, tether tension, and vehicle handling were all monitored during the flight tests. High powered LED spot lights were added to the front of the drone to verify the capability of supporting accessories onboard the drone. After an afternoon of testing and flying, our team was confident in our prototype and that we successfully met all the deliverables requested by DJI. What do you see as potential applications for your design? 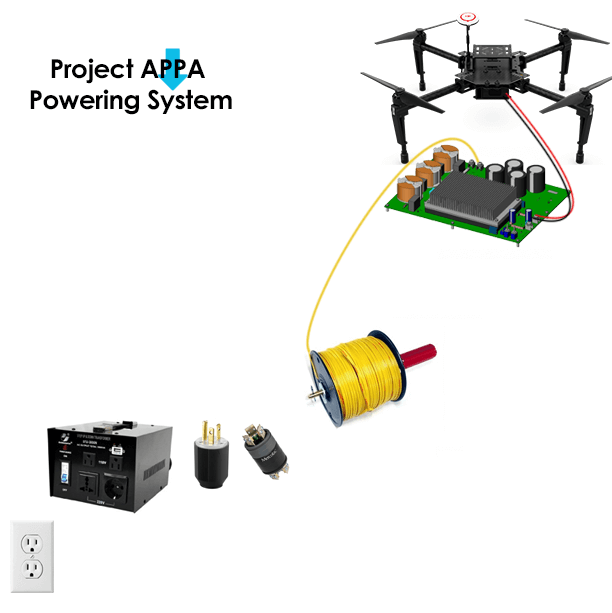 A drone that has unlimited flight and a cabled connection to the power grid opens up many possibilities. The quad could replace temporary truss towers to reach altitude and may be used as a temporary WiFi or cell tower, loudspeaker mount, light tower, or small weather station. The drone will now be able to survey areas over long periods of time since power is no longer limited to the time that a single battery can last. The tether could allow for search and rescue operations or even media coverage of sports games or music performances.